Featuring almost 60 works, “Like a Hammer” reflects the exuberance and confidence of an artist who has successfully reinvented his practice. Several years ago, the Colorado-born, New York-based Jeffrey Gibson took a hard look at his identity as a Native American (Choctaw/Cherokee) and struggling abstract painter. From that, he metamorphosed into a multidisciplinary artist — creating paintings on animal hides as well as unabashedly colorful, tactile and plumage-like objects. Think beads, tassels, yarn, metal jingles, ceramics, woolen blankets and other craft-centric materials. As introductory wall text explains, Gibson actually “razored” earlier paintings, threw them in the washer, and repurposed the fragments into collages and banners. “Like a Hammer,” the artist’s first major museum exhibition, concentrates on Gibson’s revitalized focus, with works from 2011 on. The works celebrate Native craft-making of all stripes in a manner the re-affirms cultural identity. Wall hangings gleam with hundreds of beads and metal studs forming meticulous geometric patterns, embodying Native weaving and pottery. Upon closer inspection, viewers see snippets of block text gleaned from poems, popular songs and essays — offering messages on love, survival, freedom, activism and other topics. 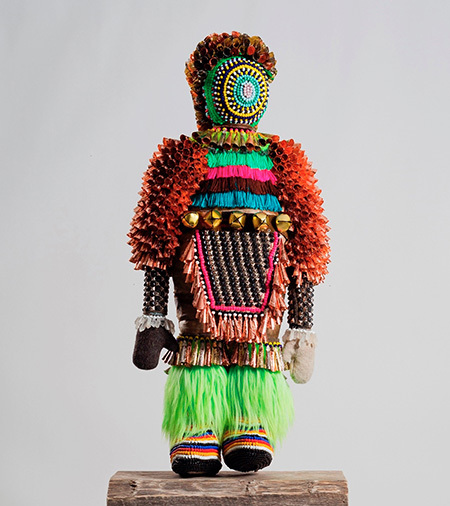 The show’s title and a decorated figure of the same name play off Peter, Paul and Mary’s “If I Had a Hammer.” Also on view are several examples of Gibson’s beaded, blanketed, tasseled and otherwise embellished figures — reminiscent of Chinese terracotta warriors and Native ceremonial dancers. Grouped throughout the show are several magnificent beaded and fringed punching bags. To Gibson, the punching bag is a vehicle for projecting his anger over Native artists’ invisibility in contemporary art. In a work such as “Our Freedom Is Worth More Than Our Pain,” he imbues the object with beauty and poignancy. Clearly, the new path Gibson has forged makes way for cutting-edge works that are unafraid to bring Native arts and culture out of the margins.